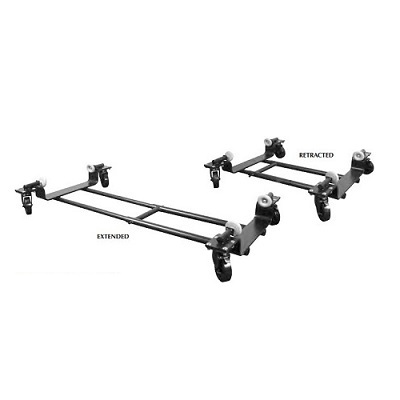 This Schaff upright piano dolly features heavy duty tubular construction and is adjustable in width and length. Comes equipped with "Colson" 5" diameter, locking swivel casters with black polyurethane "Hi-Tech" wheels that will blend in very nicely with black pianos. Length adjusts from 34" to 56"
Heavy tubular construction and adjustable in width and length. Width adjustable from 12" to 18" inside rubber bumpers. Be careful when ordering for large Yamaha or Kawai pianos as in some instances their widths are greater than 18". Length adjustable from 34" to 56" overall. Overall width 33-3/8". Pay particular attention to this dimension if truck is to be moved about between rooms. I like it. works great.